Ice skating, kids camps and more! Ah, nothing warms the heart like a giant sheet of cold ice! The Pavilion is the coolest place to play in Central Oregon in winter and summer. The Pavilion is the best place to slide, glide, twirl and curl together. 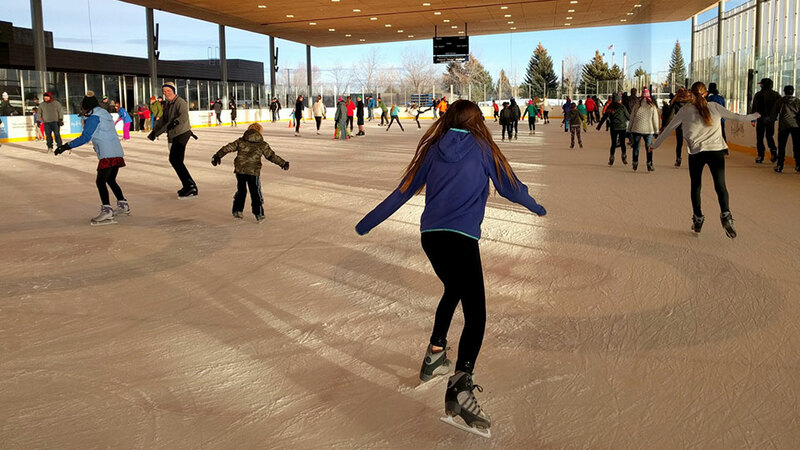 We’re home to Central Oregon’s only NHL size ice sheet that hosts league hockey, curling, skate lessons and open skating to the public. Skate rentals, lockers and changing rooms available onsite. The Pavilion hosts a variety of sport and recreation activities during the non-ice season, including drop-in play, recreation leagues and camps including basketball, pickleball, volleyball and more. The Pavilion is also home to The PAC, an exciting new summer day camp program packed with action, friends and adventure. There are plenty of ways to heat up or stay warm at The Pavilion. There’s a viewing room where you can warm up and relax by the fireplace and an outdoor plaza with a fire pit. The full-service lobby includes customer service, check-in, skate rentals and The Pavilion Cafe, which features full-service concessions, including hot drinks, yummy snacks and even meals. A local brewery is regularly on site for adult hockey and curling leagues.